This weekly challenge is on an aspect of photography that is very near and dear to me. Horizon lines are something that I find myself focusing on with without even fully processing thoughts of why I’m drawn to produce the image I am creating in the first place. They fascinate me. I love observing landscapes and the scene that unfolds within them. Landscapes are often canvases that you leave untouched, unspoiled, and undisturbed when you line up your shot. This allows the vision of what is in front of your eyes tell the storyline, perform the silent dialogue, and provoke the feelings out of your soul and into your heart. They can begin at the tips of your toes and follow a long, winding path miles from your vantage point. Horizons provoke an insatiable desire within myself to follow them until they blend in with the edge of the world; down the slopes of a mountain, along the tops of breaking ocean waves, along the frame of barns of a farm on the crest of a hill, across tops of endless dunes in the desert, and endless flat snowy fields of my hometown in Upstate New York. Horizon lines play a great role in how I frame my images, and how my mind chooses to view the world. 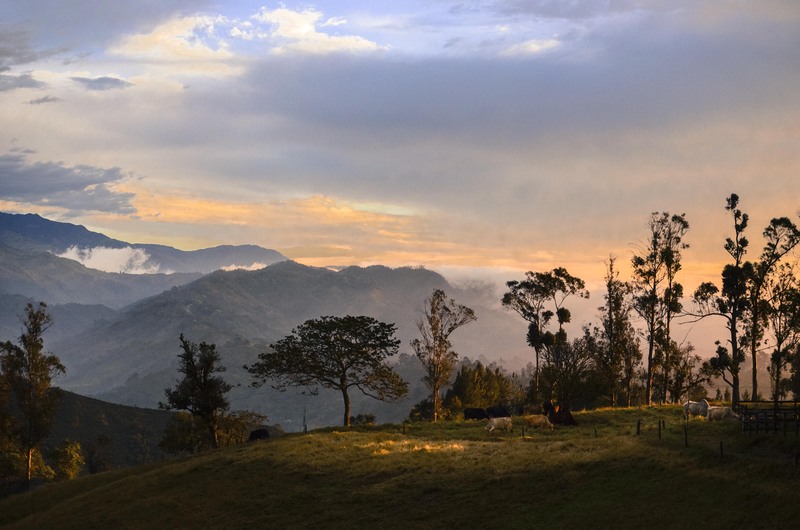 This week’s challenge brings me to share an image that will be featured in an upcoming post about my travels through the mountains of the lush valley of Corcora in Colombia. The horizon is comprised of several different layers with different focal points, which gives the image a sense of still motion. I love observing the lines from the hill in the foreground on the farm where I stood to capture the image, and the rolling mountains catching the last rays of the sunset coated with small pockets of fog rising in the valleys. There are several horizon lines crossing each other at different dips and angles, and all of them seem to disappear in the world in their own style. I hope you all enjoy this image as much as I liked taking it. I love this photo. It’s like a visual feast. I feel as though my eyes have just eaten something surprisingly and unexpectedly tasty; and I want to sit back and slowly digest the flavour whilst helplessly making “mmmmm” sounds. Your description of horizon of how you mind views the world with the accompaning photo really shows your love for composition while enjoying the moment. Yes, thanks for sharing. truly stunning, I imagine myself taking a trip, walking through this serene place. Full of dimension and detail…great composition…beautiful…looks like a seen from medievel fantasy…surreal.